Quick guide to fees and finance if you’re from Northern Ireland - Which? Note, the below refers to students from Northern Ireland remaining in their home country to study for the 2019/20 academic year (unless otherwise stated). Not from Northern Ireland, but studying at a university in Northern Ireland? You’ll need to apply to the student body in your country. Learn about financial support for England, Scotland or Wales. Students from Northern Ireland studying in the Republic of Ireland may be required to pay a Student Contribution Charge. You can apply for a Student Contribution Loan to cover this (but this has to be repaid). The exact amount you'll be charged in tuition fees will vary from university to university, and depend on the course too – it could be less than this. How can I finance my tuition fees? Don’t worry you can get a loan to cover this – you won’t be expected to pay it all upfront! Tuition Fee Loans are available from Student Finance Northern Ireland (Student Finance NI). You’ll only start repaying the loan once you've graduated and earning a certain amount. Interest is also charged on how much you owe, but this is fairly low in comparison to other loans. Because the amount you repay depends on how much you earn, and not on how much you’ve borrowed, we wouldn't recommend choosing a course based on cost alone. There are other living expenses to consider, such as accommodation, food, course materials. Students from Northern Ireland studying in their home country have access to a Maintenance Loan and either a Maintenance Grant or a Special Support Grant, to help cover these. There are also grants for students in particular circumstances, such as those with a disability or those with dependants who rely on them (eg children). Grants don't have to be paid back, unless you leave your course early or something changes dramatically in your household income and you're re-assessed (in which case you might have to repay some of the grant). However, loans do have to be repaid. Note that you'll receive slightly less in your final year. you’re living and studying away from home (not in London) – £84 per week. Like the Tuition Fee Loan, you only begin repaying this once you're earning above a certain amount. You’ll be charged interest on whatever you borrow too. household income is between £19,204 and £41,065 – partial grant depending on income. This is based on your eligibility for means-tested benefits. For example, if you’re a single parent or you have certain disabilities. How much you receive is based on the same household income criteria as the Maintenance Grant, with the same maximum amount of £3,475 available (based on 2018/19 figures). 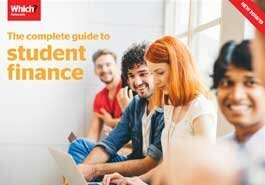 Learn more about the Special Support Grant, visit the Student Finance NI website. Maintenance Grant vs Special Support Grant: which should I apply for? The relationship between loans and grants can be a little complicated. In a nutshell, the Maintenance Grant can affect the amount of Maintenance Loan you get, but the Special Support Grant doesn’t. You’re not able to get both the Maintenance Grant and Special Support Grant. Extra help, such as grants for disability or dependents, would be considered separate from these and won’t affect what else you can get. There are also specific grants available if you have children or adult dependants or a disability too. Because they’re grants, you don’t need to pay these back. In some circumstances, medical or dental students could be entitled to a grant to cover reasonable travel costs incurred as part of their course. Bursaries and scholarships, which you never need to pay back, could be available directly from your university, as well as from companies, organisations and charities. See what students had to say about how they secured vital extra funding. These are awarded for lots of different reasons, from personal circumstances to academic achievement. How much these are worth and the application process will vary depending on who's providing them, so check with them directly for more information. What extra funding is available to help you at university? How do student loan repayments in Northern Ireland work? Repayments for student loans in Northern Ireland work the same way as they do in Scotland, as both are Plan 1 student loans. The only difference is that they're written off after 25 years, even if you didn't pay anything during some or all of that time (ie because you weren't earning above the repayment threshold). Learn more about repayments in Northern Ireland, visit the Student Loans Company site.